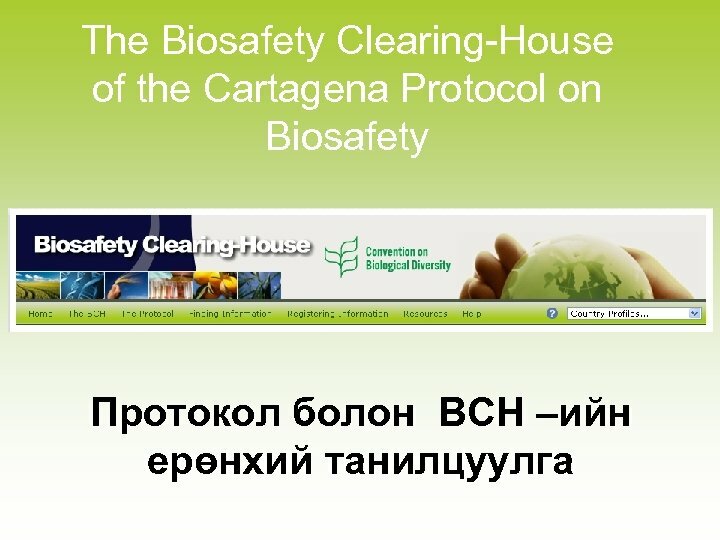 The Biosafety Clearing-House of the Cartagena Protocol on Biosafety Welcome to this tutorial on the text pages of the Biosafety Clearing-House. 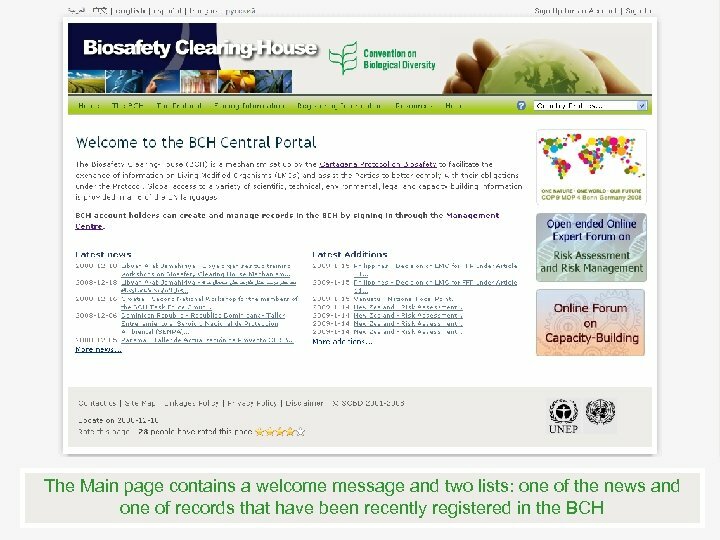 In this section you will learn about the features that can be found on the homepage as well as two sections listed in the horizontal navigation bar of the BCH named The BCH and The Protocol. 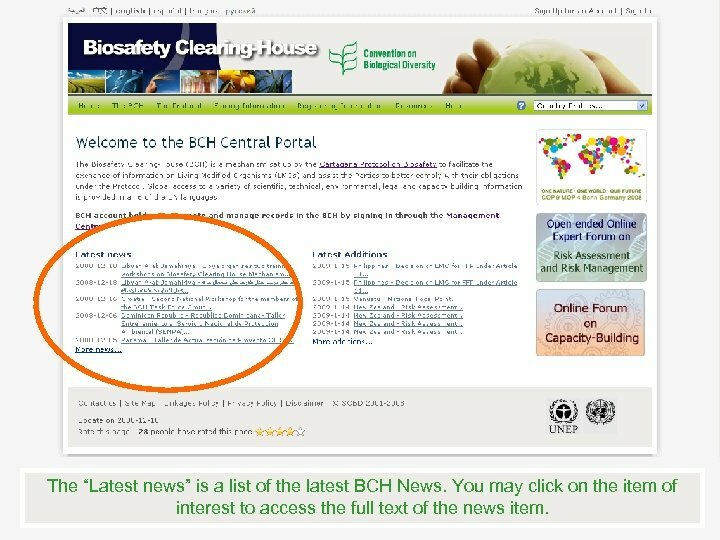 The “Latest news” is a list of the latest BCH News. You may click on the item of interest to access the full text of the news item. You may also click here to access all of the news items that have been posted on the BCH. The “Latest additions” is a list of the latest records that have been registered in the BCH. Click on the record of interest to access the complete record. 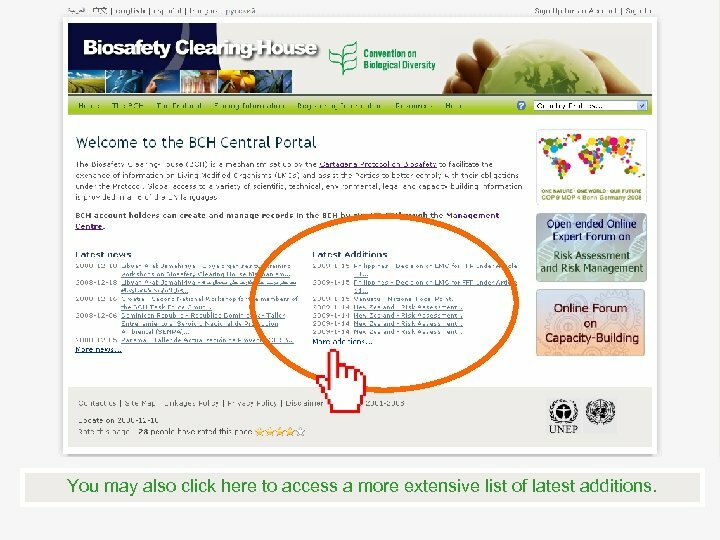 You may also click here to access a more extensive list of latest additions. 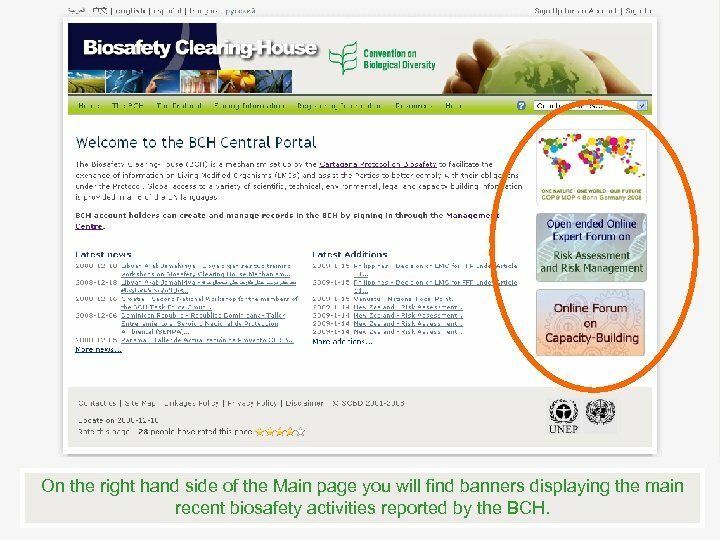 On the right hand side of the Main page you will find banners displaying the main recent biosafety activities reported by the BCH. Now let’s move to the BCH section. 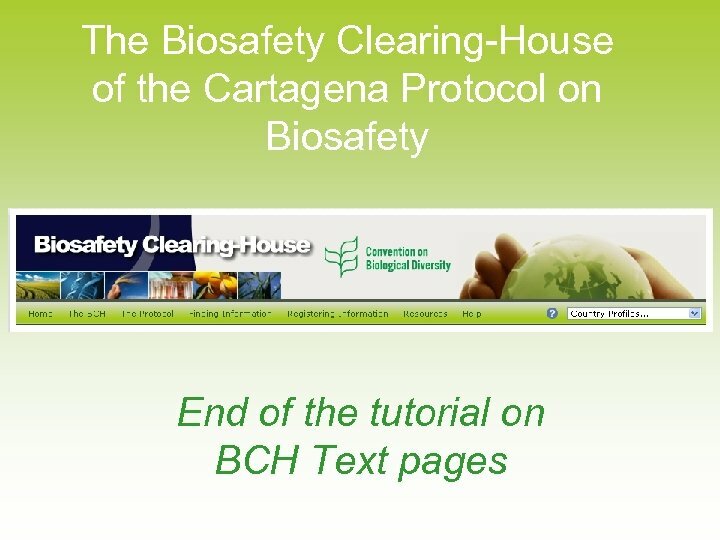 The Main page of this section provides an overview of the Mandate of the BCH as well as its Modalities of Operation and the Multi-year Program of Work which are the two primary sources of guidance on the functioning and implementation of the BCH. 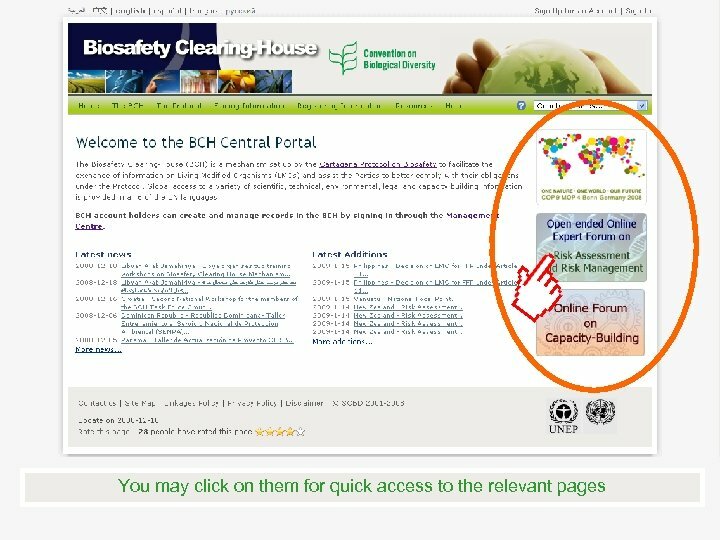 From the links in this subsection you can access the entire text of the Modalities of Operation and the Multi-year Program of Work. 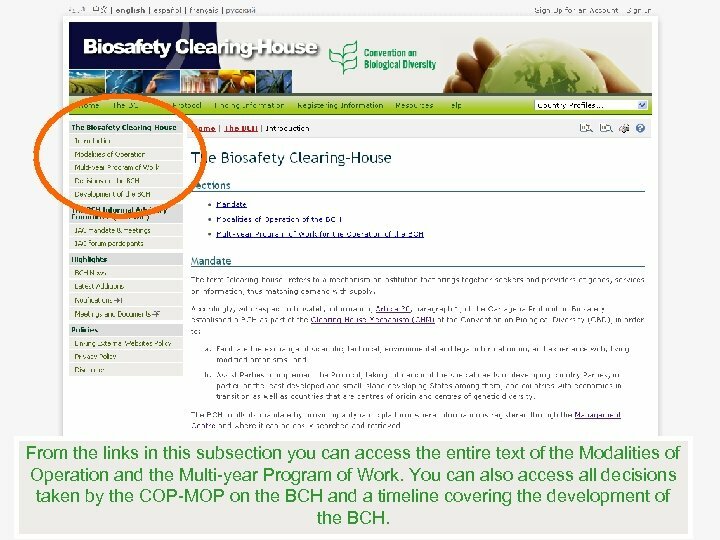 You can also access all decisions taken by the COP-MOP on the BCH and a timeline covering the development of the BCH. 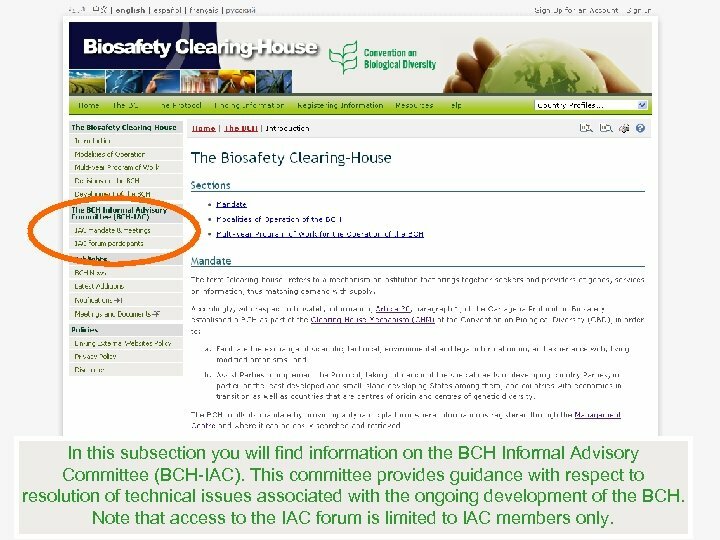 In this subsection you will find information on the BCH Informal Advisory Committee (BCH-IAC). 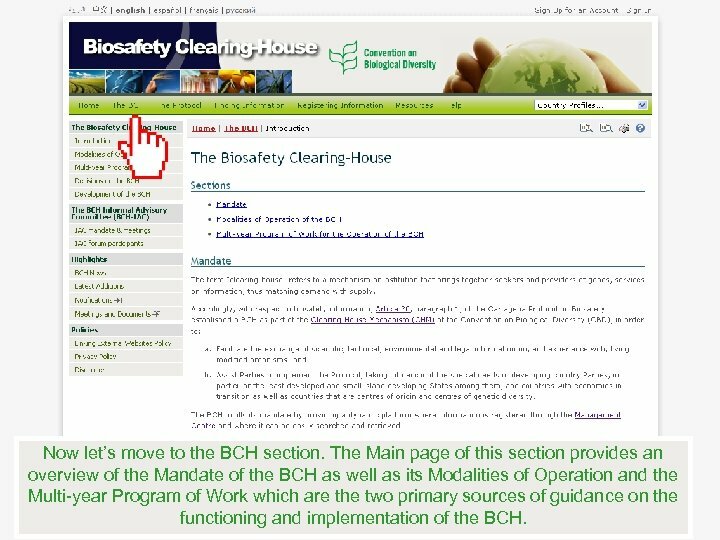 This committee provides guidance with respect to resolution of technical issues associated with the ongoing development of the BCH. Note that access to the IAC forum is limited to IAC members only. 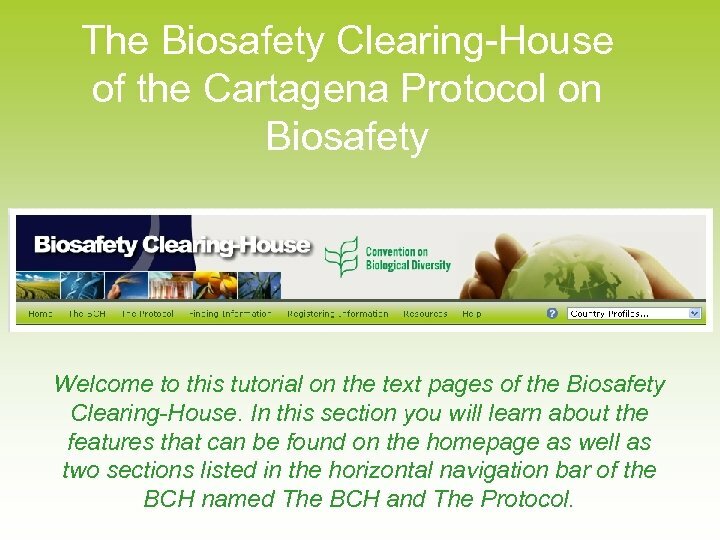 Under this heading you can access recent points of interest regarding the BCH including notifications of the CBD Secretariat on the Cartagena Protocol as well as meeting dates and documents. 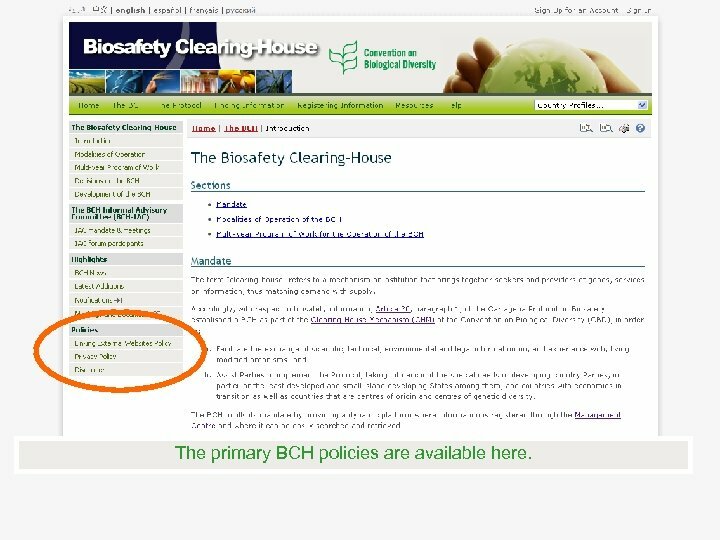 The primary BCH policies are available here. 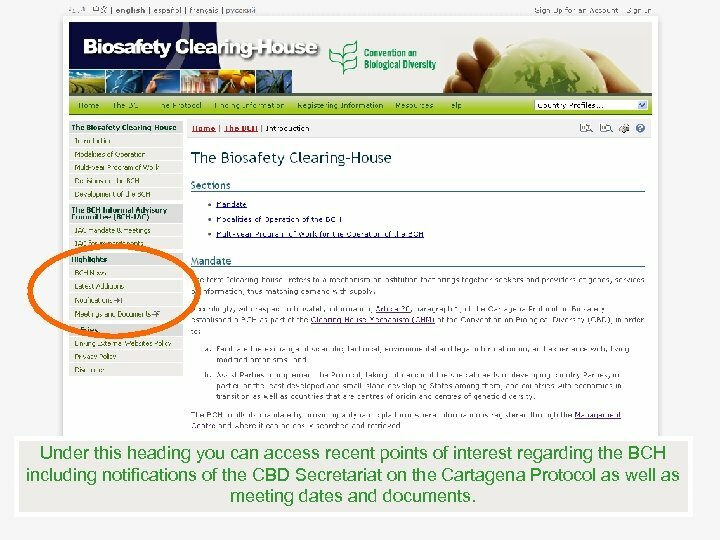 Now let’s move to the Protocol section. 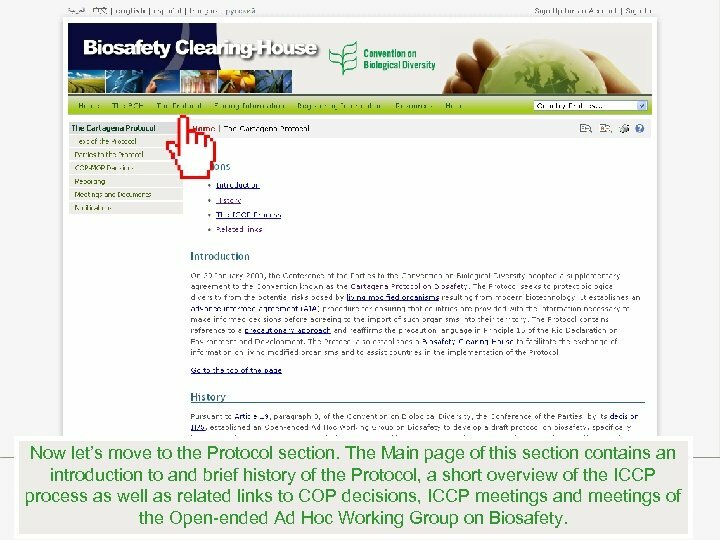 The Main page of this section contains an introduction to and brief history of the Protocol, a short overview of the ICCP process as well as related links to COP decisions, ICCP meetings and meetings of the Open-ended Ad Hoc Working Group on Biosafety. 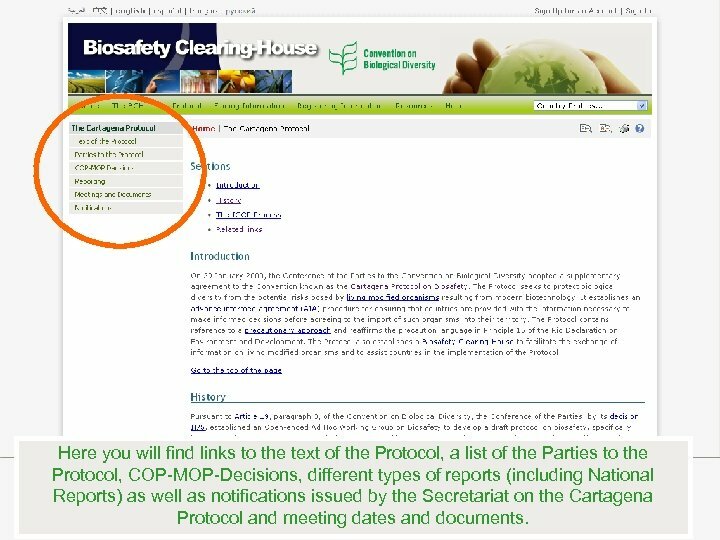 Here you will find links to the text of the Protocol, a list of the Parties to the Protocol, COP-MOP-Decisions, different types of reports (including National Reports) as well as notifications issued by the Secretariat on the Cartagena Protocol and meeting dates and documents.